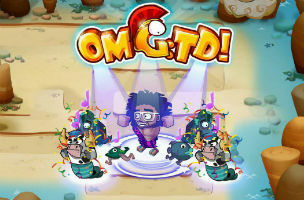 In OMG:TD!, players complete tower defense levels, using gods and heroes as their troops. Gods are stationary units, while players can tap and drag to move heroes around the area. As examples, Artemis is an archer, while Zeus zaps enemies with lighting. Hercules battles with hand-to-hand combat, and can be commanded to move around the battlefield, while Ares charges a powerful melee attack, but must rest in between movements. Battles have multiple waves, and players have access to a variety of power-ups to help them out. These may see a hero become invincible for a time, rapidly killing all enemies in a nearby radius, or may teleport enemies from the end of the path back to the beginning. Users can send down lightning commands when things get really out of hand, or can spend their collected souls (free currency collected from enemies) on upgrades for their troops. An upgrade to Artemis, for instance, makes her arrows pack a greater punch. With this newest update, Redfoo has been added to the game as a god, capable of multiple attacks or boosts. He can charge up to make nearby enemies dance for 12 seconds (while they’re also being attacked by other units). Enemies killed by Redfoo explode into bursts of confetti, dealing heavy damage to nearby enemies. Finally, Redfoo has a 30 percent chance of summoning a stampeding zebra to attack foes with heavy damage. Outside of this game update, observant viewers will also notice OMG:TD! content in Redfoo’s latest music video “New Thang.” Yodo1 is working with other “global brands” to introduce additional branded IP into future games. OMG:TD! is available to download for free on iOS. The Redfoo character is available as a premium purchase for $3.99.